These butterscotch brownies will hit the spot for just about anyone with a sweet tooth. 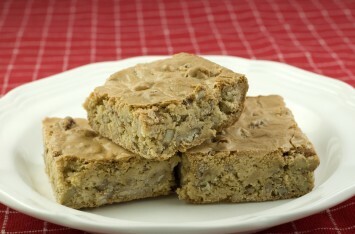 They are a mix of yummy blondies with sweet butterscotch pieces and crunchy pecans. Can you even get better than that? I don’t think by much! Cream the butter and add the brown sugar, beating well. Add the eggs and vanilla to the mixture, beating well. Combine the flour, baking powder, baking soda and salt. Add the dry ingredients to the creamed mixture, stirring well. Pour the batter into a greased 13x9x2 inch baking pan. Sprinkle with the morsels and pecans. Bake for 30 minutes. Cool and cut into bars. Add the butterscotch piesces and chopped pecans to the batter if you prefer and top the cake with powdered sugar, icing or another small bag of butterscotch chips mixed with more pecans. Of course you can also substitute chocolate chips for the butterscotch, or mix them half and half. Use chopped walnuts instead of pecans if you prefer. It will be delicious. Instead of putting the butterscotch morsels and pecans on the top you can add them to the batter once it is all mixed. You can change the nuts if you want. Chopped walnuts would be delicious in this recipe too, so if you have those on hand and thing you would like it, give it a try. These squares are so easy you can have fresh baked goodies on hand any day of the week. Kids and adults alike will love them. Leave the top plain or add a second package of butterscotch pieces to the top. How decadent would that be?! Either way, if you like sweet, I think you will really love these. Butterscotch brownies are just one of our delectable sweet treat dessert recipes. Find them all here.